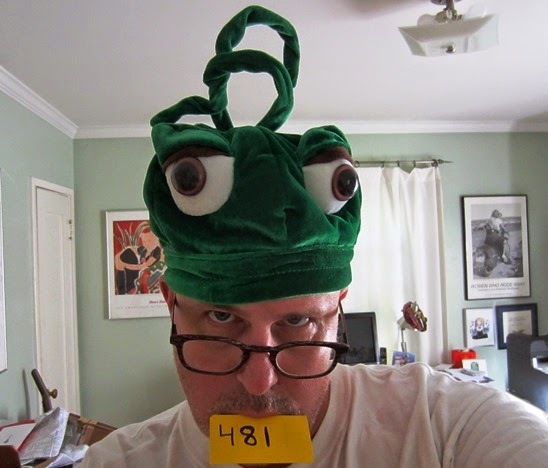 Day 481 / Hat 481: Green velvet grasshopper hat with bendable green antennae, bulging white velvet eyes with brown, hard plastic irises and brown fabric eyelids (such detail!). Interior label reads: "Little Daydreamers by Elope," on one side and: handmade in China, RN #91951, spot clean only." Fabrication tag reads: "55% cotton, 45% polyester." I haven't actually seen Amy since college, but thanks to the marvel that is Facebook we've kept in touch. She actually lives out here in Southern California (down Fullerton way) and the loan of this hat has extra-special significance for two reasons. First, she's been an ardent fan and supporter of my whimsical quest since way back when I was was wearing single-digit lids. Second, and perhaps most importantly, early on she provided some extremely important motivation for me to make sure I followed this Project through to the 500th hat. Having shown one of my very, very early installments (perhaps the very first one, I don't recall exactly) to her young daughter, she comments to me via Facebook something to the effect of: "The girl child doesn't think you're gonna make it." As a result, in those few and far between times where sourcing a hat has been particularly challenging or on occasions where the non-hat-related life circumstances surrounding me have been so daunting and so overwhelming that it seems pointless to continue throwing hats in the ring, I think about that little girl I've never met and how she doubted me big time. As I type this I realize I don't even know really know her name. Nonetheless, it's "the girl child" who gets the hat-tip on this one, with the assist to her mom. As Master Po might say in the "Kung Fu" TV series that was most likely on the air the years Amy and I were at camp, "It takes patience, young Grasshopper, patience."